THE CHIEF SECRETARY'S LODGE (Deerfield), Phoenix Park, Dublin, was originally built by Sir John Blaquiere, 1st Baron de Blaquiere, and became the Chief Secretary for Ireland's official residence in the late 18th century. The Chief Secretary for Ireland, a position analogous to Prime Minister, had his office within Dublin Castle. The office was abrogated when Éire (as it was then called) seceded from the United Kingdom in 1922. It is now the official residence of the United States Ambassador to the Republic of Ireland. Colonel John Blaquiere came to Ireland as Chief Secretary to the Viceroy, Lord Harcourt, in 1772. 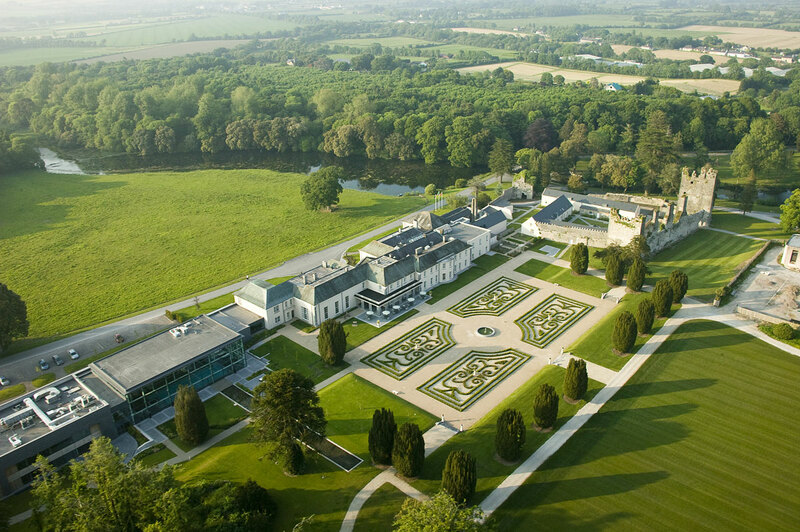 Like Viceregal Lodge (Áras an Uachtaráin) across the road (former residence of the Lord Lieutenant of Ireland), the Chief Secretary's Lodge, or Deerfield as it is now called, is surrounded by its own sixty-acre park, with wonderful views of the Dublin mountains. The Lodge, which cost £8,000 to build, comprises two storeys with two projecting bowed ends facing southwards. There were two principal reception rooms. A commodious staircase hall is bedecked with American flags and presidential portraits. The brilliant white porte-cochère admits visitors under a large bust of President Lincoln. The architect of the Lodge, with its immaculate walled gardens, fruit trees and glass-houses, is unknown. 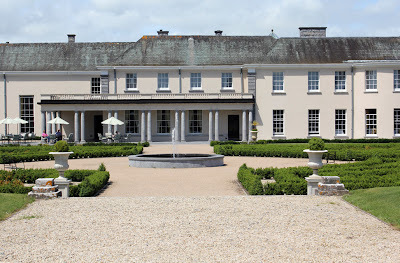 In 1784, the house was acquired by HM Government as an official residence for the Chief Secretary for Ireland, analogous with the office of prime minister. Illustrious occupants have included the Hon Sir Arthur Wellesley (1st Duke of Wellington), Lord Castlereagh, Sir Robert Peel and Lord Randolph Churchill. Sir Winston Churchill, as a small boy, roamed the gardens and woods and took great delight in riding up and down the paths in his donkey and cart. In 1927, the United States sent its first envoy, Fred Sterling, to the newly-formed Irish Free State. Mrs Sterling noticed the empty house whilst walking in Phoenix Park, told her husband she'd found the ideal residence for him, and Deerfield has remained a part of American soil ever since. First published in September, 2011. THE RT HON JAMES HEWITT (1709-89), having attained great eminence at the English bar, and filled successively the offices of King's First Sergeant and judge of the Court of King's Bench, was appointed, in 1767, LORD HIGH CHANCELLOR OF IRELAND, and elevated to the peerage, in 1768, as Baron Lifford, of Lifford, County Donegal. His lordship was advanced to a viscountcy, in 1781, as VISCOUNT LIFFORD. His lordship wedded secondly, Ambrosia, daughter of the Rev Charles Bayley, of Knavestock, in Essex, and by that lady had George, Ambrosia, and Elizabeth, all who died unmarried. THE VERY REV JAMES, 2nd Viscount (1751-1830), Dean of Armagh, who wedded firstly, in 1776, Henrietta Judith, eldest daughter of Arthur, 1st Viscount Harberton, but by that lady had no issue. John Pratt, in holy orders. Alicia Anne; Susan; Anne Georgiana. ARCHIBALD ROBERT, 6th Viscount (1844-1925), was a captain in the Royal Navy. EVELYN JAMES (1880-1954), 7th Viscount, DSO, fought in both the Second Boer War and the First World War. ALAN WILLIAM WINGFIELD, 8th Viscount, who was the son of the Hon George Wyldbore Hewitt, 7th son of the 4th Viscount. 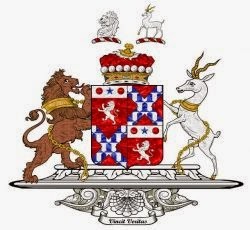 As of 2010 the titles are held by his son, Edward James Wingfield, 9th Viscount (b 1949). 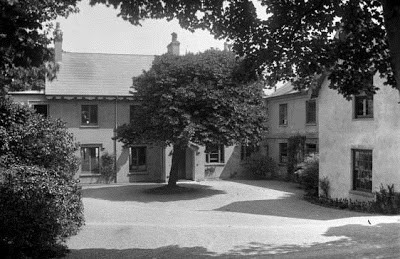 MEENGLASS HOUSE, sometimes spelt Meenglas, near Stranorlar, County Donegal, was a Victorian house in a simple Tudor-Revival style with steep roofs and gables; mullioned windows, relatively small for the size of the house. It had a three-sided bow; and a dormer window with tracery; a slender, square turret at the junction of the main block and service wing, with a sprocketed pyramidal roof. The 1st Viscount resided at Santry House, Dublin, for a period. First published in May, 2013. Lifford arms courtesy of European Heraldry. This family is very ancient, being descended from the Blakistons, of Blakiston, County Durham; two members of which family were created baronets; one by JAMES I, in 1615, and the other, by CHARLES I, in 1642. MATTHEW BLAKISTON (c1702-74), an eminent merchant of London, was elected an alderman in 1750; served the office of sheriff in 1753; and filled the civic chair in 1760. In 1759, Mr Alderman Blakiston received the honour of Knighthood, and was created a baronet in 1763. SIR MATTHEW, 2nd Baronet (1761-1806), born in the Mansion House during the mayoralty of his father. SIR MATTHEW, 3rd Baronet (1783-1862). As of 2008, the title is held by the 8th Baronet's eldest son, Sir Ferguson Blakiston, 9th Baronet, who lives in New Zealand. John Blakiston-Houston, MP for Down North, was a son of Richard Blakiston-Houston (of Orangefield, County Down), a younger son of the 2nd Baronet. Charles Blakiston-Houston, was MP for Belfast Dock from 1929-33; and his fifth and youngest son, John Blakiston-Houston (1881–1959), was a major-general in the Army. Beltrim estate in County Tyrone forms part of the Blakiston-Houston estate. 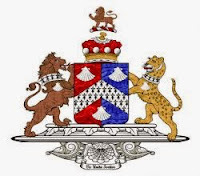 Richard Patrick Blakiston-Houston was born in 1948; educated at Eton; JP and DL of County Down; registered as a Professional Associate, Royal Institution of Chartered Surveyors, in 1972, and High Sheriff of County Down, 1989. He lived in 2003 at Beltrim Castle, County Tyrone, and The Roddens, Ballywalter, County Down. Interestingly, the Blakiston-Houston family appear to be related to General Sam Houston, after which Houston, Texas, USA, was named. Orangefield Park in east Belfast was the family home of the Houston family in the 19th century. The head of the family, John Holmes Houston, was a partner in the Belfast Banking Company and lived at Orangefield House with his family. Orangefield was situated at the end of what is now Houston Park and the estate itself extended to almost 300 acres. John and Eliza's daughter, Mary Isabella, was born in 1793 and later married Richard Bayly Blakiston. The two families joined names, leaving J Blakiston-Houston in charge of the Orangefield estate from 1857. 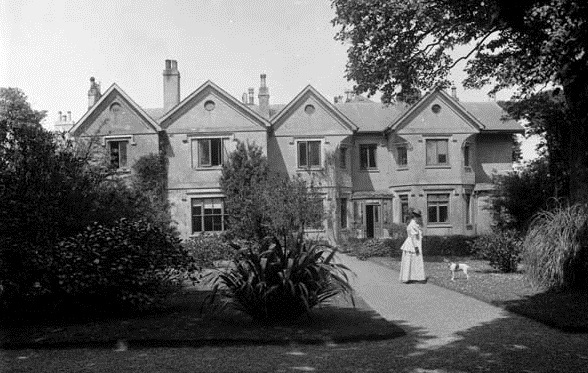 In 1934, the Blakiston-Houston family offered Belfast Corporation (now the council) part of the Orangefield estate to develop as a public park. The corporation, although keen to buy the land, felt that the price was too high. After lengthy negotiations, they bought part of the site in 1938 for £20,000. Development work was put on hold due to World War II and plans for the park were only drawn up in 1947. HENRY BOYLE, of Castle Martyr, being sworn of the Privy Council in Ireland, filled some of the highest political offices in that kingdom (Speaker of the house of commons, Chancellor of the Exchequer, Lord Justice etc). He was elevated to the peerage, in 1756, as Baron Castle Martyr, Viscount Boyle, and EARL OF SHANNON. RICHARD, 2nd Earl (1728-1807), KP, PC, who, having filled some high political offices, and being sworn of the Privy Council, was enrolled amongst the peers of Great Britain, in 1786, as Baron Carleton, of Carleton, Yorkshire. His lordship was a Knight Founder of the Most Illustrious Order of St Patrick, 1783. 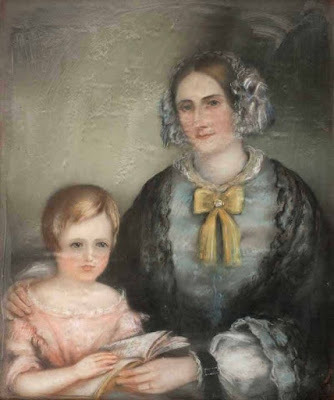 Catherine; Sarah; Louisa Grace; Jane; Elizabeth; Charlotte Anne. Richard Henry John Boyle, 10th Earl (b 1960). The heir presumptive is the present holder's second cousin, Robert Francis Boyle. CASTLE MARTYR, County Cork, was built in the early 18th century by Henry Boyle, Speaker of the Irish house of commons, afterwards 1st Earl of Shannon. The house was substantially enlarged by the 2nd Earl between 1764-71; and further re-modelled in the late Georgian period. 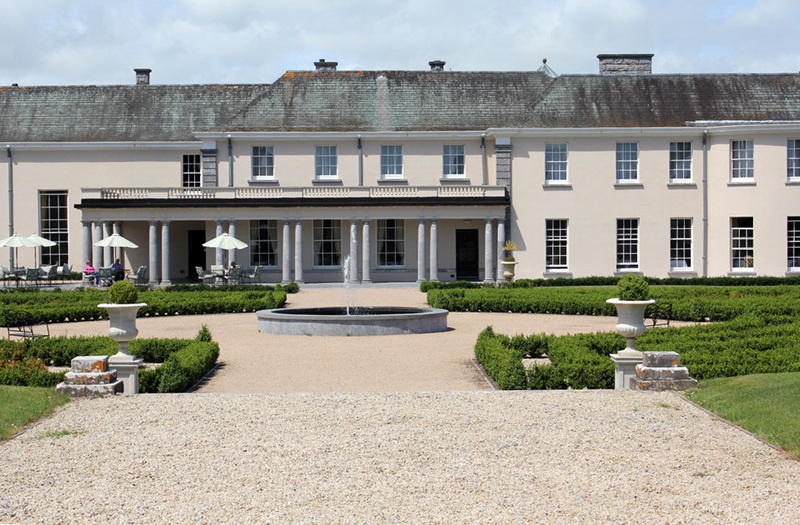 The entrance front is of two storeys and seventeen bays, comprising a five-bay recessed centre and giant pedimented portico between projecting wings. The entrance front of the house overlooks a sheet of water which is part of the remarkable artificial river made before 1750 by the 1st Earl. Castle Martyr was sold early in the 20th century to the Arnott family; then became a Carmelite college. It now forms the nucleus of a luxury hotel resort. Former town residence ~ 7 Connaught Place, London. First published in July, 2013. 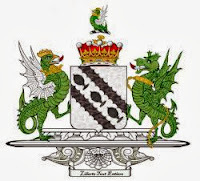 Shannon arms courtesy of European Heraldry. The 1st Baronet, later to become the first Prime Minister of Northern Ireland, was created Viscount Craigavon in 1927, when the baronetcy merged with the viscountcy. I have written an article about his family here. Born at Sydenham, a suburb of Belfast, Craig was the youngest of six sons of James Craig JP, of Craigavon and Tyrella, County Down, a successful whisky distiller and businessman in Belfast. Educated at a private school in Holywood, County Down and afterwards at Merchiston Castle, Edinburgh, the younger Craig became a stockbroker. However, with the start of the Boer War in 1899 he ceased formally to be a member of the Belfast Stock Exchange and took a commission in the 3rd (Militia) Battalion of the Royal Irish Rifles. Serving with distinction as a lieutenant with the Imperial Yeomanry, he was captured by the Boers but survived the barren conditions of a concentration camp and returned home with a firm and lasting conviction of the British way of life. The 1st Viscount was still prime minister when he died peacefully at his home, Glencraig, County Down, in 1940. He was buried at the Stormont Estate. James Craig (1906-74), 2nd Baronet and 2nd Viscount, was educated at Eton. He was a Lieutenant-Commander in the Royal Navy Volunteer Reserve and fought in the Second World War. Janric Fraser Craig (b 1944), 3rd and present Baronet and 3rd Viscount, was born in 1944; educated at Eton; graduated from London University with a Bachelor of Science and a Bachelor of Arts. Lord Craigavon was invested as a Fellow, Institute of Chartered Accountants and was an Elected Member of the House of Lords in 1999; lives in London. There is no heir to the viscountcy. 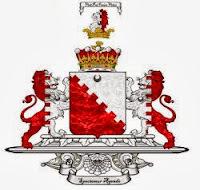 This family is not sprung from any of the ancient Irish houses of Butler; but from George Butler, of Fenny Drayton, in Cambridgeshire, and of Tewin, in Hertfordshire. This George, living in 1575, son of Edward Butler, was said to be descended from John Butler, living at Waresley, Huntingdonshire, in 1376. SIR STEPHEN BUTLER, Knight (descended from John Butler, of Waresley, Huntingdonshire, living in 1376), settled in Ireland in the reign of JAMES I, being an undertaker in the plantation of Ulster, and having obtained a grant of 2,000 acres of land in County Cavan, erected a baronial castle of great strength. He and his co-undertakers of the precinct of Loughtee commenced, according to their agreement, the plantation of a town at Belturbet; and in his time thirty-five houses were erected, all inhabited by British tenants, most of whom were tradesmen, each having a house and garden plot, with four acres of land, and commons for a certain number of cattle. FRANCIS BUTLER, MP for Belturbet. This gentleman bore arms in the royal cause during the civil wars. 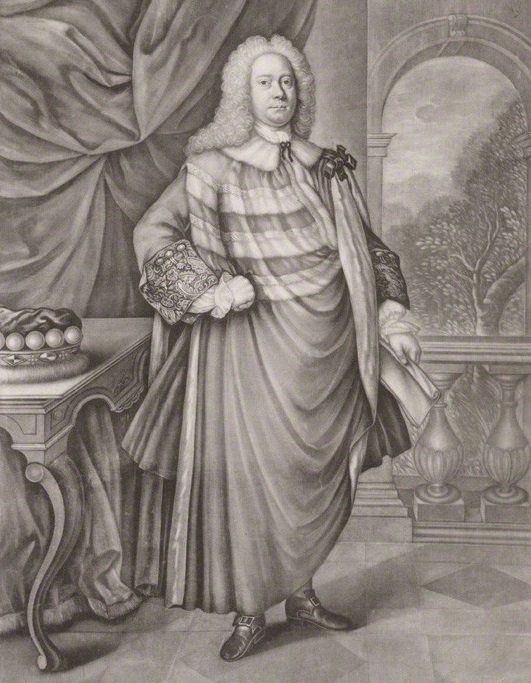 THE RT HON THEOPHILUS BUTLER (c1669-1723), of Belturbet, County Cavan, who was elevated to the peerage, in 1715, as Baron Newtownbutler, with remainder, in default of male issue, to the male descendants of his father, having previously represented County Cavan in parliament and being called to the Privy Council. BRINSLEY, 2nd Baron (1670-1735), Gentleman Usher of the Black Rod, Colonel of the Battle-axe guards, who was created Viscount Lanesborough in 1728. Judith, m to B J Cramer. HUMPHREY, 2nd Viscount (1700-68), who wedded, in 1726, Mary, daughter and heir of Richard Berry, of Wardenstown, County Westmeath, by whom he had an only son. Mary; Catherine; Charlotte; Caroline; Sophia. LANESBOROUGH LODGE, County Cavan (also known as Quivvy Lodge), stood very close to the border with County Fermanagh. It was adjacent to Lord Erne's land at Crom estate. The Lodge was a two-storey Tudor-Revival house of ca 1810, comprising a main block and a lower, two-storey service wing. 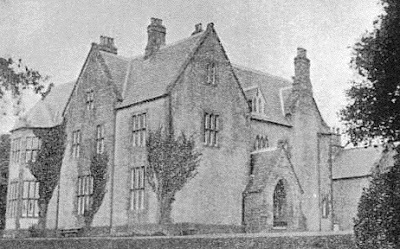 It was extended to the rear in 1846. There were gables, mullioned windows, and a corbelled oriel. 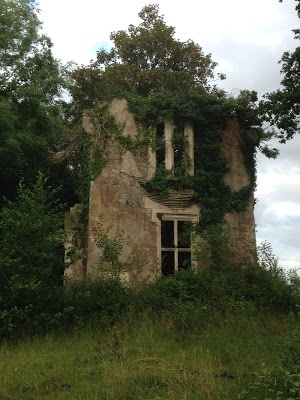 The house is now derelict and ruinous, having been burnt in the 1920s. The importance and scale of the estate is indicated on historic maps by the related structures that are marked, including a yacht house, boat house, boat slips, a landing place, an engine house, various outbuildings, ice-house, and a walled garden. Though now ruinous, Lanesborough Lodge retains much of its historic character and form. Since this justly admired nobleman and his amiable Countess returned to their estates in Cavan, the tenantry have had one unbroken scene of rejoicing. Today a large party, numbering uupwards of 1,000, dined at Lanesborough Lodge, Belturbet, on the invitation of the Earl and Countess. We will give the particulars in our next. It is to be regretted that these reunions are not more frequent generally, as they would tend to break down prejudices and unite landlords and tenants in all struggles for their mutual advantage and the benefit of the common weal. There is an old estate school on the way to the Lodge and beyond are the remains of a laundry and the steward's house. 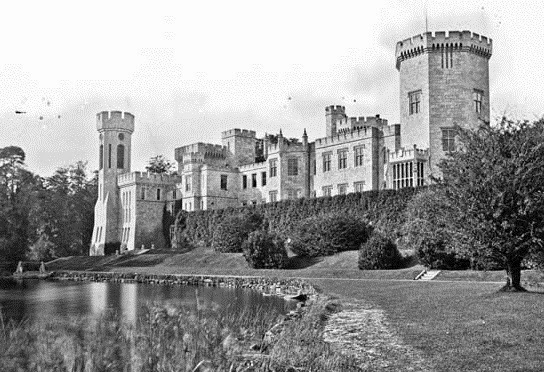 The family also owned Inish Rath Island on Upper Lough Erne, County Fermanagh. The island is located north-west of Crom estate. The Victorian-Tudor style house on the island (above) was built in 1854 by the Hon Henry Cavendish Butler-Danvers (1811-91), a half-brother of the 5th Earl of Lanesborough. It was subsequently purchased by the Earl of Erne for use as a hunting lodge. During the early 20th century, the house was used for boating parties etc. The island went through continuous change of ownership for about thirty years, when it was bought and sold. At the height of the Northern Ireland Troubles, in 1982, property prices slumped in this border area. 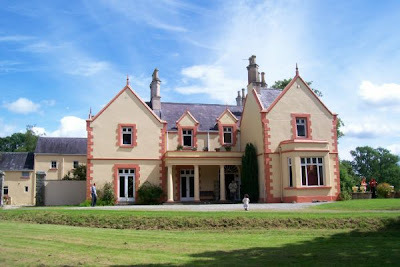 A group of Hare Krishna monks, led by a German follower, Prithu Das, pooled their resources and took out a bank loan to buy Inish Rath, a perfect setting for a Hare Krishna centre. The Hare Krishna temple was established in the west wing of the house with a magnificent gold altar at one end of the long room and a life size representation of Swami Prabhupada at the other. Oriental arches frame the windows and polished pine floors add to the overall feeling of light and space. SWITHLAND HALL, Leicestershire, was held by the family of Danvers until 1796, but after the death of Sir John Danvers (the last male of his line) it passed to his son-in-law, Augustus Richard Butler, 2nd son of the 2nd Earl of Lanesborough, who adopted the surname of Danvers-Butler. The current hall was partially completed in 1834 and finished in 1852 by the 6th Earl. Other seats ~ Lanesborough Lodge, County Fermanagh; Swithland Hall, Leicestershire. Town residence ~ 8 Great Stanhope Street, London. First published in July, 2013. Lanesborough arms courtesy of European Heraldry. OLD COURT demesne is located at Strangford, County Down. I have written about the barony of de Ros here. The 23rd Baron de Ros, a grandson of the 20th Earl of Kildare and 1st Duke of Leinster, inherited the port and village of Strangford, which became his principal seat. In 1844, he built Old Court and surrounded it with pleasant walks and gardens. Lord de Ros also made many improvements, extended Payne's Chapel at Old Court and built Katherine's Quay as his own private harbour. 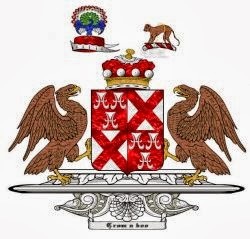 Dudley, 24th Baron, was equerry to HRH The Prince Consort (Prince Albert), 1853-74. His life at Court during the period 1850-62, and his manuscript account, gives interesting personal reminiscences of certain events which occurred while he was acquainted with, and in the service of, Queen Victoria and Prince Albert, as well as dinner and shooting lists, etc. Una Mary, 26th Baroness, attended Court in an application for compensation for criminal injury to property, after a malicious fire had destroyed Old Court at the end of 1921, together with two lists of articles lost. Nevertheless, it seems that the family were popular with the villagers generally and there was much sadness at the time when the old house was burnt. OLD COURT was a low, rambling two-storey house with many gables, some of them set on three-sided bows, the angle walls of which curved outwards under the eaves, so that some of the upstairs windows were bent in a vertical plane, like the windows at the stern of an old man-of-war ship. There were barge-boards on the gables and hood mouldings over the windows. It was located at the site of the present 1970s house (also called Old Court) in a most picturesque setting overlooking the harbour and Strangford Lough. In the grounds, nestling in a glade nearby, there is a splendid little private chapel originally built in 1629, surrounded by an old graveyard. It is believed that the chapel is still used regularly by the family and villagers. Today the demesne stretches from Strangford Bay to Strangford village, skirting the shore-line. In the 1980s Georgiana, 27th Baroness, and her husband (Lieutenant-Commander J D Maxwell DL RN) lived in the present Old Court House; while their son Peter Maxwell (present Lord de Ros) had a bachelor pad down in the little boat-house at Katherine's Quay. When he married and succeeded to the title, he built a relatively modern house in the grounds, not far from the delightful little Old Court chapel. Peter Maxwell is the 28th and present Baron. First published in July, 2011. 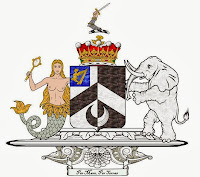 De Ros arms courtesy of European Heraldry. CALEDON HOUSE, County Tyrone, otherwise known as Caledon Castle, is a Classical mansion of 1779 built for James Alexander, 1st Earl of Caledon. The designer was Thomas Cooley. The house was originally of two storeys, with a seven-bay entrance front and pedimented breakfront centre. The garden front has one bay on either side of a broad, central, curved bow. The side elevations comprise five bays. In 1812, the 2nd Earl extended and enhanced the mansion to the designs of John Nash. Two single-storey domed wings (otherwise pavilions) were added to each side of the entrance front, projecting forwards. 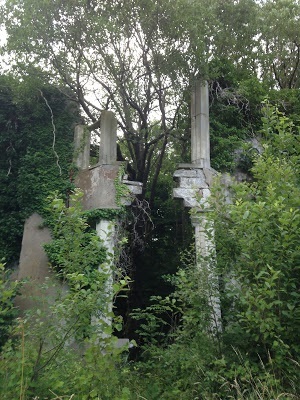 These wings contain a colonnade of coupled Ionic columns and formed a veranda. One wing, with its coffered dome and smaller columns, contains the library. The oval drawing-room is said to be one of the finest of its kind, with its sumptuous Regency interior; gilded friezes of Classical figures; and mouldings in cut paper work. The drapery pelmets are intricately shaped. The 2nd Earl undertook further additions to the house in 1835. A third storey was built on to the main block and the pediment, resplendent with the Caledon arms, was also raised. The entrance was relocated to one side of the house, with a single-storey extension with another domed octagonal hall. A noble porte-cochère stands over the porch, with smaller Ionic columns with a splendid stone and metal cast of the Caledon crest (a raised arm in armour holding a sword). The original hall of the mansion house became the saloon. 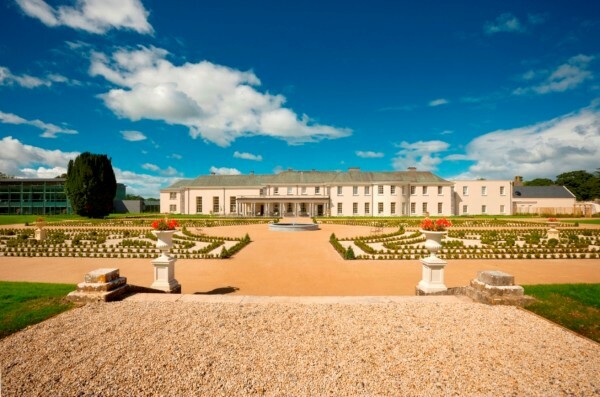 THE walled demesne at Caledon is one of Northern Ireland's finest landscape parks. During the Victorian era, the Earls of Caledon were the third largest landowners in County Tyrone, after the Dukes of Abercorn and the Earls Castle Stewart. The estate's significance and condition has been enhanced throughout successive generations of the same family to the present day. Caledon Estate is largely contained by the river Blackwater within its eastern and southern boundaries; and the village of Caledon to the north-east. Most of the estate lies in County Tyrone, though it straddles counties Armagh and Monaghan. The original Caledon Castle was the seat of the 5th Earl of Cork and Orrery, a friend of Dean Swift. It was said, in 1738, to be "old, low, and, though full of rooms, not very large." Lord Orrery was the biographer of Jonathan Swift and friend of Dr Johnson, as well as an improving landlord who did much to beautify the gardens around his newly-acquired residence, through planting and the addition of ornamental buildings and statues. In 1747, he constructed a folly-like bone house in the garden (faced with ox bones), which he intended should "strike the Caledonians with wonder and amazement". It is the only element of his garden ornamentation to survive to the present day. On the death of his kinsman, Richard, 4th Earl of Cork, in 1753, Lord Orrery became Earl of Cork and Orrery. His wife Margaret died in 1758 and, with the death of Lord Cork himself in 1762, the Caledon estate passed to their son, Edmund, 7th Earl (1742-98). It is during the period of the 7th Earl of Cork and Orrery's tenure that the earliest documentation concerning the modern village of Caledon dates. Lord Cork sold his estate to James Alexander in 1776 for £96,400 (about £14 million in 2014). This new landlord was the second son of Alderman Nathaniel Alexander of Londonderry. He made his fortune in the service of the East India Company during the 1750s and 60s, returning to Ulster in 1772 worth probably over £250,000 (£34 million in 2014). With this money, he proceeded to accumulate estates in Counties Donegal, Londonderry, and Antrim, as well as Caledon, to which he added neighbouring townlands (some bought outright, some leased) in both Tyrone and Armagh. In 1779, he built a new classical mansion, to designs by Thomas Cooley, either on the site of, or a short distance from, the old Hamilton residence. The 1st Earl died in 1802 and was succeeded by his son, Du Pré, 2nd Earl, who served as the first governor of the Cape of Good Hope between 1806 and 1811, where the river Caledon and the District of Caledon are named after him. The celebrated landscape designer, John Sutherland, re-designed Caledon estate in 1807. In 1827, further improvements were made by the landscape designer W S Gilpin. There are splendid parkland and woodland trees (some renowned for their monetary value), and the estate has a benign climate for tree growth. The estate boasts a 19th century pinetum, fastigiate yew avenues, a lake, deer park (red deer) with a lake. The disused Union Canal and river Blackwater enhance the water features. In the late 19th century the park was inhabited by black bears, caught by the 4th Earl (1846-98), who had ranched in the American west (father of Field Marshal the 1st Earl Alexander of Tunis). The walled gardens are in sections, the one closest to the offices with glasshouses, fruit and vegetables. The estate contains a large number of buildings, including gardeners' cottages, lodges, stables, and offices. A number of the former estate workers' cottages have been modernized and are available for rental. The Doric Lodge, dating from about 1780, is possibly by Thomas Cooley. The grand and elaborate Twin Lodges of 1812 at the main entrance, by John Nash, are guarded by Coade stone sphinxes, Caledon arms and gilded earls' coronets. The Glaslough gate lodge, the School gate lodge, and the Tynan gate lodge (all ca 1833) are likely the work of Thomas J Duff. Other buildings include the head gardener’s cottage, a sunken tunnel to the offices, the keeper’s house, the dower house and several bridges. There is an old cross and well along the main drive to the House. First published in June, 2015. Caledon arms courtesy of European Heraldry. THE REV GIDEON SCOTT, Oxford, went over to Ulster as Chaplain in WILLIAM III's army in 1688, and purchased the Willsboro' estate, 1696. He married Jane, daughter of Robert McNeill, of Ballintoy, County Antrim, by Margaret his wife, daughter of Sir John Ruthven, and widow of Sir Dugald Stuart Bt. WILLIAM SCOTT (1705-76), of Willsborough, County Londonderry, for many years Recorder and MP for the city of Londonderry, Prime Sergeant, Judge of the King's Bench, and eventually a Baron of the Exchequer. Hannah; Mary Anne Martha; Jane. THOMAS SCOTT JP DL (1783-1872), of Willsboro', High Sheriff of County Londonderry, 1844, Lieutenant, Bengal Army, Brigade Major of Yeomanry, Ireland, who espoused firstly, in 1823, Hannah, widow of John Campbell, of Limavady. He wedded secondly, in 1827, Anne Monaghan; and thirdly, in 1844, Katharine Elizabeth, eldest daughter of the Rev Thomas Richardson, of Somerset, near Coleraine, County Londonderry. Elizabeth; Hannah; Annette; Hatton Thomasina; Katharine Emily; Jane B.
Anne Frances Emily, d 1891. WILLSBOROUGH HOUSE, otherwise Willsboro', near Eglinton, County Londonderry, is a mid-19th century house of two storeys and six bays, flanked by canted, projecting bays at either end. The roof is concealed behind a cornice and parapet. It faces westwards across flat terrain to the river Foyle, County Londonderry. The demesne dates from 1696. A walled garden, gate lodge, and some mature trees remain. In 1735, the Londonderry City Corporation had set up a committee to find an economical way of furnishing the poor of the city with heating fuel. They agreed to contract William Scott of Willsborough, near Eglinton, to supply turf to the city. The lands of Willsborough were originally deep flat bog and the Scotts reclaimed this bog, over the next one hundred years, by constructing canals and shipping turf to the city’s quay. From 1746, William Scott agreed to supply the city annually, for 21 years, 32,000 barrels of turf at 1½ pence per barrel. The Corporation also agreed to pay Mr Scott an additional £50 per annum if he supplied the quota of 32,000 barrels. First published in June, 2015. ALEXANDER McCLINTOCK, of Trinta, County Donegal (only son of Alexander McClintock, who came from Argyllshire and purchased in 1597 the estates in Donegal) wedded, in 1648, Agnes Stenson, daughter of Donald Maclean. WILLIAM, ancestor of McClintock of Dunmore. Mary Anne; Elizabeth; Rebecca; Fanny. JOHN McCLINTOCK (1770-1855), of Drumcar, 'Bumper Jack' McClintock, MP, commissioned the building of Drumcar House, near Dunleer, in 1777. His mother was Patience, daughter of William Foster, MP for County Louth and first cousin to John Foster, 1st Baron Oriel. His paternal grandfather was Alexander McClintock (d 1775). Anne Florence; Harriette Elizabeth; Emily Selina Frances. JOHN, 1ST BARON RATHDONNELL (1798-1879), High Sheriff of Louth, 1840, MP for County Louth, 1857-59, Lord-Lieutenant of County Louth, 1867-79. 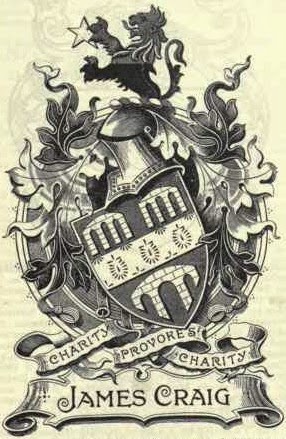 Mr McClintock was elevated to the peerage, in 1868, as BARON RATHDONNELL, of Rathdonnell, County Donegal, with remainder to the male issue of his deceased younger brother, Captain William McClintock-Bunbury. His lordship married Anne, sister of Sir John Henry Lefroy, and they lived between Drumcar, County Louth. Their London home was at 80 Chester Square. The marriage was childless. THOMAS KANE, 2nd Baron (1848-1929), who wedded, in 1874, Katharine Anne, eldest daughter of the Rt Hon Henry Bruen, of Oak Park, County Carlow, by his wife Mary Margaret Conolly, third daughter of Lt-Col Edward Michael Conolly, of Castletown, County Kildare. Lieutenant, Scots Greys; Captain, Leicestershire Yeomanry; Honorary Colonel, 6th Battalion, Royal Irish Rifles, 1896-1929; Sheriff of County Carlow, 1876; Lord-Lieutenant of County Carlow; President, Royal Dublin Society 1918-29. The 2nd Baron was the last Lord-Lieutenant of County Carlow, from 1890 until 1922. THOMAS LEOPOLD, 3rd Baron (1881-1937), MBE, who married, in 1912, Ethel Synge, second daughter of Robert Wilson Jevers CMG, Sheriff of County Carlow, 1909. 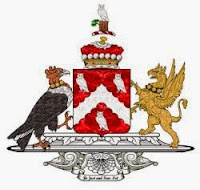 THOMAS BENJAMIN, 5th and present Baron, born in 1938; married, in 1965, Jessica Harriet, only daughter of George Gilbert Butler, of Scatorish, Bennetsbridge, County Kilkenny. 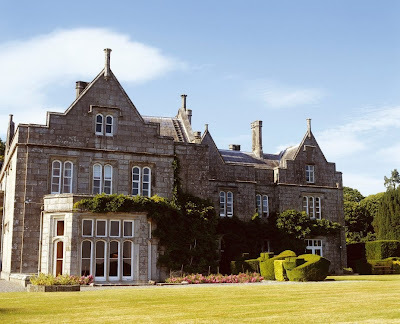 LISNAVAGH HOUSE, near Rathvilly, County Carlow, is a large, rambling, granite ashlar Tudor-Revival mansion, built in 1847 for William McClintock-Bunbury MP, brother of the 1st Baron Rathdonnell. 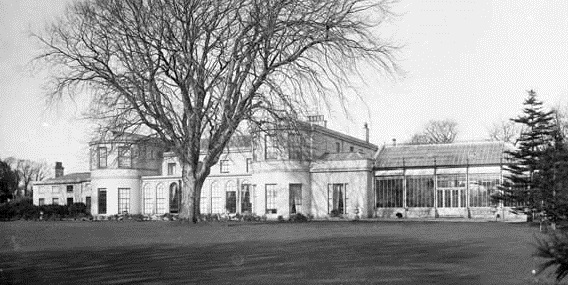 It's on an irregular plan with porte-cochere, bay windows and gables; designed by Daniel Robertson; truncated and re-ordered about 1953; Stable building and walled garden to rear. 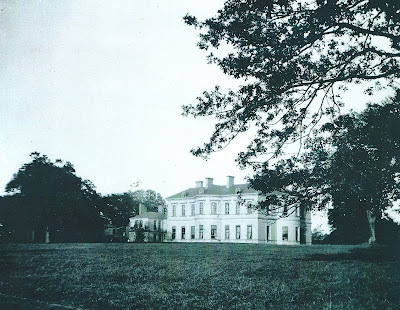 Lisnavagh House was substantially reduced in size about 1953 by the 4th Baron; that section of which contained the principal rooms being demolished; while the service wing was adapted to provide requisite accommodation. The estate has been a family home for eleven generations and covers hundreds of acres. The estate includes Lisnavagh House, several cottages, excellent grazing for cattle & tillage land for maize, barley and wheat. Over 250 acres of mainly hardwood woodland sees Beech, Oak and Ash and other native woodland species thrive allowing a healthy biodiversity of flora and wildlife to exist in its surrounds. This woodland is now managed and protected and naturally fallen timbers are recycled into the now highly sought after exclusive wooden Bunbury chopping Boards. Lisnavagh Estate and House are available for private hire for exclusive weddings, yoga sleep retreats, annual community and social events. Also available to guests are short term rental of 4 self catering cottages on the grounds. First published in June, 2013. 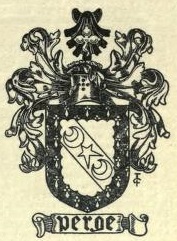 Rathdonnell arms courtesy of European Heraldry. RICHMOND LODGE, Knocknagoney, County Down, was a large, two-storey, late Georgian residence. It had octagonal bays at either end and a central porch. The house stood in its own grounds comprising 24 acres, close to the location of the present Knocknagoney housing estate. It was said to have been built ca 1798. 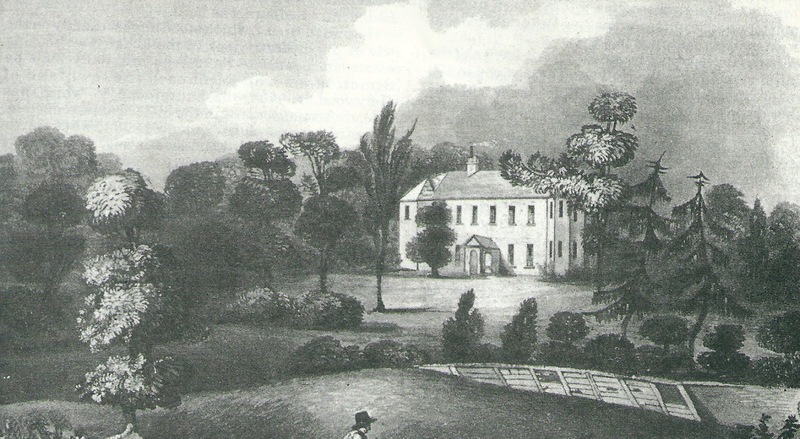 The first known occupant of Richmond Lodge was Francis Turnly (1765-1845), son of Francis Turnly JP, of Downpatrick, County Down, who had leased it or the land from David McCance about 1800. 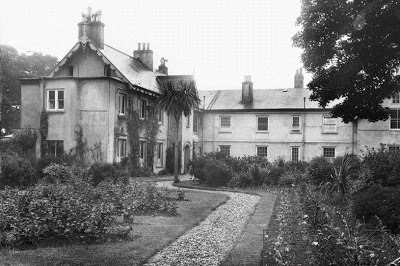 Turnly lived at Richmond Lodge in 1824. The family also owned Rockport House. When Turnly's widow, Dorothea, died in 1846, Richmond passed to John Dunville (1786-1851), the well-known distiller. Richmond Lodge remained with the Dunvilles until 1874, when John Dunville's son William died and it was sold to James Kennedy, who began a number of improvements, including a new avenue approach about 100 yards south of the original main entrance. 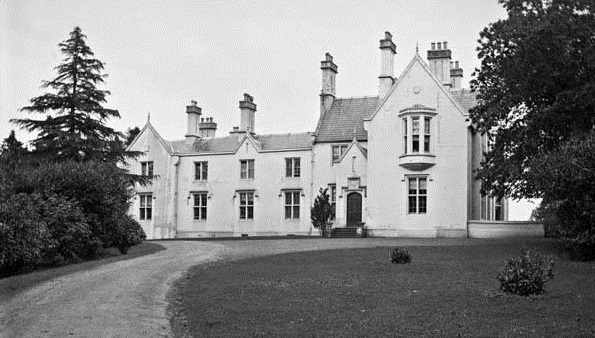 By 1902, Richmond Lodge had become the home of the Rt Hon William Henry Holmes Lyons JP DL (1843-1924). WILLIAM SMYTH, of Rossdale, Yorkshire, passed over into Ulster in the reign of CHARLES I, and settling at Dundrum, County Down, became ancestor of the family which we are treating, and of the Smyths of Drumcree, Gaybrook, etc. WILLIAM SMYTH, of Dundrum, married Mary, daughter of Thomas Dewdall, and by her had two sons, viz. THE RT REV THOMAS SMYTH (1650-1725), was, for his great piety and learning, at the recommendation of Dr Tennison, Lord Archbishop of Canterbury, promoted to the see of Limerick in 1696. CHARLES SMYTH (1694-1784), who succeeded to the estates of his father, represented the city of Limerick in parliament for 45 years. Juliana, mother of CHARLES, 2nd Viscount. JOHN PRENDERGAST-SMYTH, was elevated to the peerage, in 1810, as Baron Kiltarton, with remainder to his nephew, Charles Vereker, the son of his sister Juliana. His lordship was advanced to a viscountcy, in 1816, as VISCOUNT GORT, of Gort, County Galway. CHARLES, 2nd Viscount, PC (1768-1842), Constable of the City of Limerick, Colonel of its Militia, and Privy Counsellor. JOHN PRENDERGAST, 3rd Viscount (1790-1865), sold the family seat, Lough Cutra Castle. LOUGH CUTRA CASTLE, once known as Loughcooter Castle, is near Gort in County Galway. It was designed by John Nash and is located in a romantic setting above a lough. 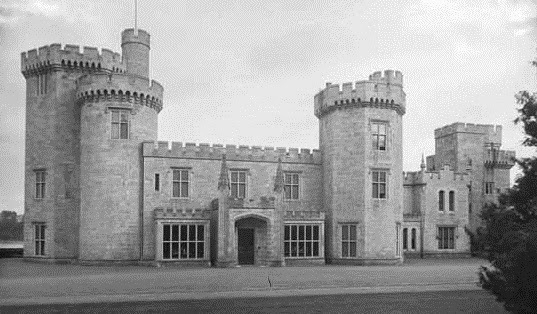 The Castle was built from 1811 for the 2nd Viscount Gort, who had an admiration for East Cowes Castle on the Isle of Wight and stipulated that his new home should be similar in design. Lough Cutra Castle is battlemented with machiolations. The 3rd Viscount suffered ruinous financial losses as a result of the Irish famine, since he refused to collect any rents and donated large sums to charity. 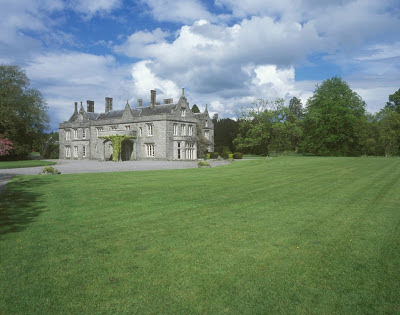 Consequently, Lough Cutra was sold by the Encumbered Estates Court in 1851. The Gort family subsequently moved to the Isle of Wight, where they, somewhat ironically, acquired East Cowes Castle. Lough Cutra was purchased in 1854 by Field-Marshal the Viscount Gough, who added a wing and clock-tower two years later. During the Victorian era, the estate comprised 6,628 acres. Interestingly, Lord Gough commissioned wallpaper by Cole & Son for a design featuring Union Flags and coronets. The Castle was sold by the Gough family later in the 19th century and remained empty for many years; until it was bought back post-1945 by the 7th Viscount Gort for his great-niece, Elizabeth Sidney. Thereafter the Castle was sold again and is now privately owned. In May, 2015, TRH The Prince of Wales and The Duchess of Cornwall visited Lough Cutra Castle. First published in May, 2015. Gort arms courtesy of European Heraldry. GEORGE PERCEVAL (1635-75) was the youngest son of Sir Philip Perceval, Knight, the distinguished statesman (great-grandfather of John, 1st Earl of Egmont), by Catherine Usher his wife, daughter of Arthur Usher and granddaughter of Sir William Usher, Clerk of the Council and Registrar of the Prerogative Court, Dublin. George Perceval was drowned near Holyhead on his voyage to England with the Earl of Meath and other persons of distinction. WILLIAM PERCEVAL (1711-84), barrister-at-law, married firstly, in 1838, Elizabeth, daughter of John Croker, of Dublin. She dsp 1739. ROBERT, of whom we treat. Anne Sarah; Maria Dorothea; Caroline; Madelina. ANNA CAROLINE, of Groomsport House. Major Perceval-Maxwell was a farmer, breeder of Shorthorns and Herefords, and an active figure in the political and cultural life of Northern Ireland. He was a member of both the NI House of Commons and Senate; and from 1945-49 was Parliamentary Secretary in the Ministry of Commerce. He was also a founder member of the NI Regional Committee of the National Trust in 1936 and for a time the NI Government nominee on the Council of the NT in London; DL of County Down in 1935. The Perceval-Maxwell Papers are held at the Public Record Office of Northern Ireland. GROOMSPORT HOUSE, Groomsport, County Down, is a two-storey Victorian mansion of 1849, in the Tudor-Revival style. It has a high basement, and has been considerably altered and extended since it became a hotel and, thereafter, apartments. 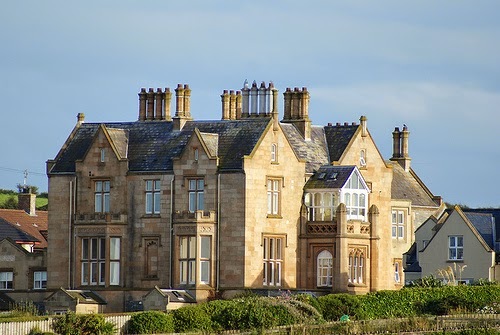 Groomsport House is situated to the east of the village overlooking the sea and the Copeland Islands. The former porch entrance now forms part of the upper floor; while a section of the basement has been excavated to form an apartment. The mansion house was designed by James Sands for Robert Perceval-Maxwell. In Griffith's Valuation (1856-64) it is listed as the residence of Robert Perceval-Maxwell and leased from his uncle, John William Perceval-Maxwell, of Finnebrogue. 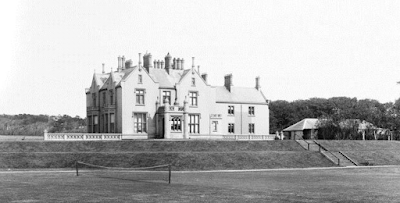 The Perceval-Maxwells owned much of the land in and around Groomsport. James Sands visited the site in 1844. Freestone was shipped from Glasgow six months later, with the accounts concluding in 1848 at a total sum exceeding £6,000 (about £623,000 in today's money). In 1870, Robert Perceval-Maxwell became the owner in fee of the property, following his uncle's death in 1869 without issue. A Tour of North Down carries a photograph of the house with a partial view of the grounds dating from ca 1910. Robert Perceval-Maxwell's main residence was Finnebrogue, near Downpatrick, during this period. Two of his grown-up unmarried daughters (see lineage above) continued to live in the house until they died ca 1930. The house remained unoccupied during the 2nd World War and was used for "secret military work". In 1951, the Perceval-Maxwell family occupied their home again. Gavin Perceval-Maxwell restored the house prior to its sale in 1968. The house was opened as a hotel thereafter, but closed in 1999 and has now been converted into apartments.